According to the US Department of Labor, 75-million Americans depend on mobile tools to effectively perform their job. 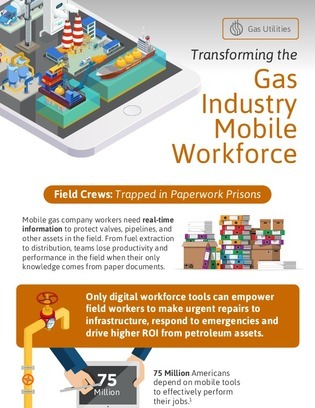 In this infographic, discover how mobile gas company workers are using digital workforce tools to make urgent repairs, respond to emergencies, and drive higher ROI from petroleum assets. To learn more about the benefits of digital workforce tools, download this infographic, and learn how you too can radically boost operational efficiency and asset longevity.